The below guide is a step by step configuration guide for deploying Microsoft Azure Load Balancer to front-end and load-balance Parallels RAS Environment deployed on Microsoft Azure on Infrastructure as a Service (IAAS). Note: It is assumed that reader has a basic understanding of both Microsoft Azure and Parallels RAS. This guide will only focus on the configuration of Microsoft Azure Load balancer and Parallels Secure Client Gateways’ load balancing. The required Parallels RAS ports identified here are to be opened both from the Azure Network Security Groups (NSG) and the Windows firewall on the Virtual machines (VMs) in question. This guide focuses on the Basic load balancer configuration not the Standard. However, both are supported to be implemented to load balance frontend traffic to Parallels RAS infrastructure. The following high-level logical diagram shows a load-balanced endpoint for external traffic that is shared and load balanced among two instances acting as Parallels RAS Secure Client Gateways which are setup in high availability and located in a segregated secured network (DMZ). 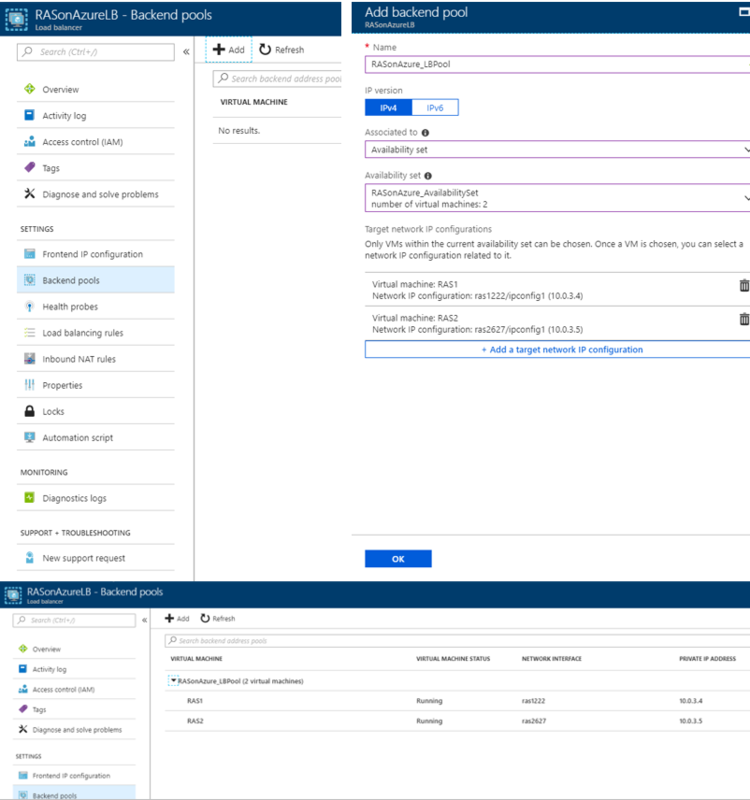 Prior to deploying Parallels RAS Secure Client Gateway servers on Microsoft Azure as Infrastructure as a Service (IAAS), it is important to create an Availability Set. 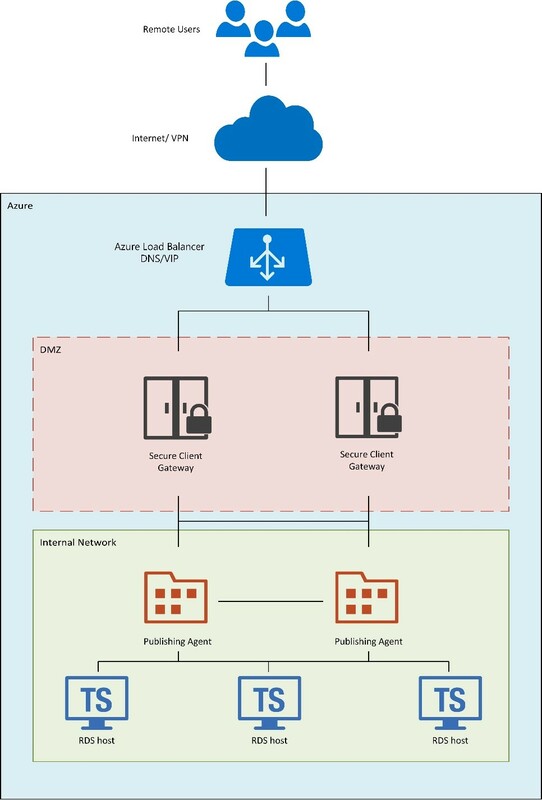 In this guide, we are illustrating the creation of on an availability set as part of the creation of VM itself via the Azure portal. Choose Fault domain - Defines the group of virtual machines that share a common power source and network switch. Please see here for further information regarding fault domain and update domain. Microsoft Tip: To provide redundancy to your application, we recommend that you group two or more virtual machines in an availability set. 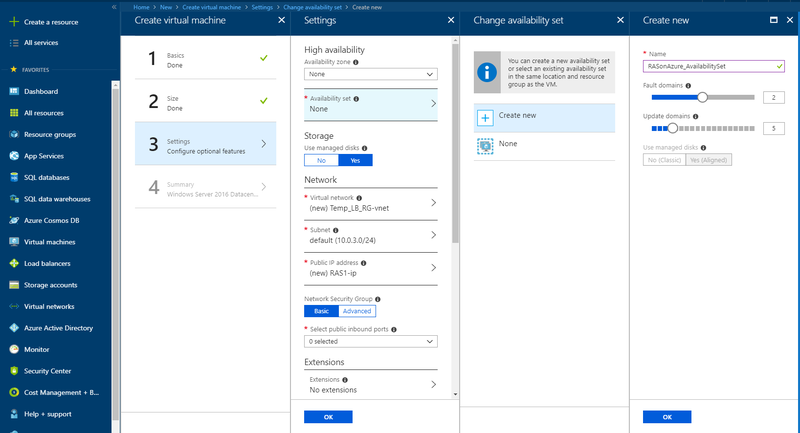 This configuration ensures that during a planned or unplanned maintenance event, at least one virtual machine will be available and meet the 99.95% Azure SLA. Additionally, please see here for other methods to create an Availability Set. The availability set of a virtual machine can't be changed after it is created. You need to delete and then recreate the virtual machine if you require to change the availability set after VM creation. Complete the creation of VMs that are planned to host the Parallels RAS SCG. VM creation is out of scope for this guide however can be easily carried out from the Azure Portal VM creation wizards. Please see here for quick create guide. 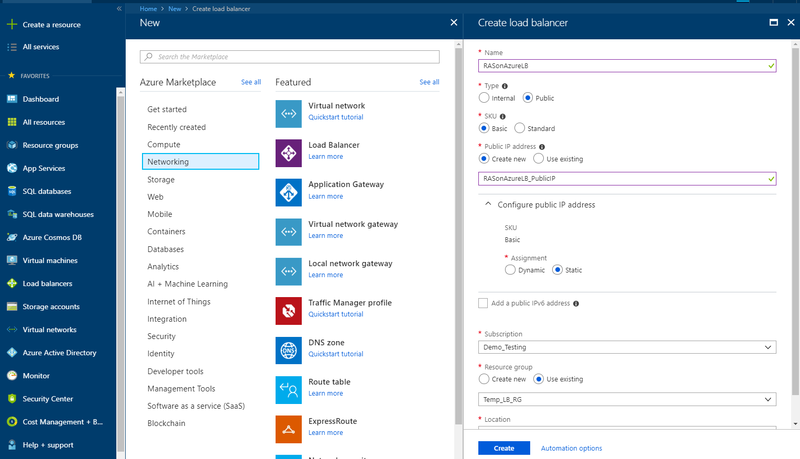 Once the VMs have been created in their Availability Set hosting the Parallels RAS SCG as mentioned in Step1 and Step2 above, you can move on with creating the actual Azure Load Balancer. Load balancing provides a higher level of availability and scale by spreading incoming requests across multiple virtual machines (VMs). We will be creating a public basic load balancer from the Azure portal. On the upper-left side of the portal, select Create a resource > Networking > Load Balancer. Once deployment has been successful you should see the resources created including the Azure Load Balancer and the Public IP. To distribute traffic to the VMs created earlier, a back-end address pool needs to be created. This will contain the IP addresses of the virtual NICs that are connected to the load balancer. Create the back-end address pool RASonAzure_LBPool to include RAS1 and RAS2 acting as RAS SCGs from the Availability set created in Step 1. Select All resources on the left menu, and then select RASonAzureLB from the resource list. Under Settings, select Backend pools, and then select Add. For Associated to, from the drop-down menu, select Availability set. Select Add a target network IP configuration to add each virtual machine (RAS1 and RAS2) that you created to the back-end pool. We need to create a load balancing rule to be able to choose what traffic is going to be load balanced on to our load balancing pool. Prior to this at least one health probe must exist. The load balancer created previously needs to monitor the status of the backend servers to be able to distribute traffic successfully. This can be achieved by using health probes. The health probe dynamically adds or removes VMs from the load balancer rotation based on their response to health checks. Navigate to your Load balancer settings -> Health probes. Interval: Signifying the amount of time between probe attempts. By default and minimum value is 5 seconds but can be changed as required. Unhealthy threshold: Which specifies the number of consecutive probe failures that must occur before that particular VM is considered unhealthy/down. By default and minimum value is 2 consecutive failures but can be changed as required. It is recommended to create a Health probe for each Load Balancing rule specifying the port and protocol. A load balancer rule is used to define how traffic is distributed to the VMs, in our case the Parallels SCGs. The frontend IP configuration, for the incoming traffic, and the back-end IP pool to receive the traffic, along with the source and destination ports are configured. 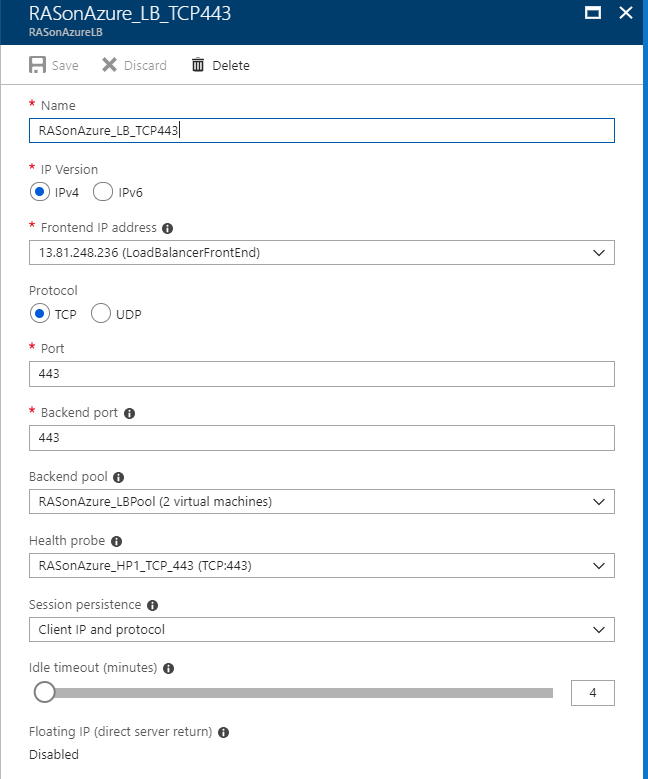 Create a load balancer rule named RASonAzure_LB_TCP443 for listening to port 443 in the front end loadbalancer. The rule is also for sending load-balanced network traffic to the back-end address pool RASonAzure_LBPool, also by using the health probe RASonAzure_HP1_TCP443. Under Settings, select Load balancing rules, and then select Add. The final step is to test the Azure load balancer that was deployed to load balance frontend traffic to the Parallels Secure Client Gateways. 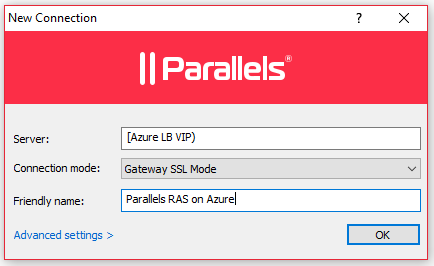 Testing can be done from the native Parallels Client installed on the device or from the HTML5 Client portal by putting the Azure Loadbalanced Virtual IP (VIP) or DNS name which should load balance traffic to one of the specified Secure Client Gateways.